We are in Bariloche, in Patagonia in southern Argentina. 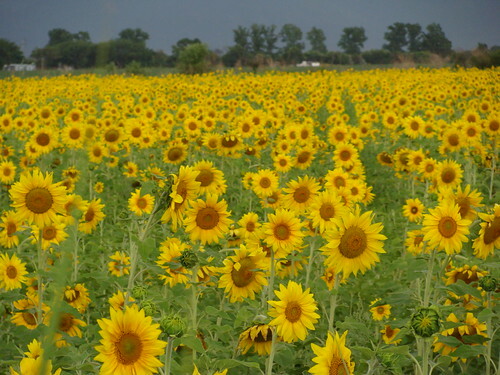 We have rented an apartment for a month and will enjoy a gorgeous place with fine weather. As winter approaches in the Northern Hemisphere, we will be exploring the lakes district which is surrounded by snow-capped mountains and spring weather. Please let me know if you are sufficiently jealous. We rode from Salta, Argentina, a jazzy city in Northern Argentina, through the Canyon of the Shells (Quebrada de Las Conchas or Quebrada de Cafayate) an impressive multi-colored landscape with interesting geological and cultural history. As my friend, Linda, described It is like Moab, Utah but with more pizazz. The landscape was inspiring as we traveled down the las Conchas Ravine and colorful sedimentary mountains towered over us. I was gleeful to be riding. Amazed at that we where riding this region in Northern Argentina. How lucky can we be? We camped along a small river in a remote town of Alemanía. It was not a real campground, just a green quiet spot down by the river not too far from the tiny village. When we got there, we set up the tent and relaxed awhile. I sat and drew the landscape with my traveling watercolor kit while Randy worked on the computer he bought in Salta. No surprisingly there was no wifi at our campsite -- there was not even a bathroom. Horses grazed by me, a herd of goats trekked by, stopping to give me a once over. Dogs sat next to me waiting for a morsel. A tracker drove through the river bank. Teenagers came and went. As the day turned into night, incredible magical sounds and sights of nature came to life. The sky filled with the blinking neon lights of fireflies, a huge toad with his/her mating hitchhiker parked in front of our tent and loudly croaked in competition with other similar boisterous toads. A constant greenish light emanated from large cicada bugs (or something) which mingled with the flashing fireflies. 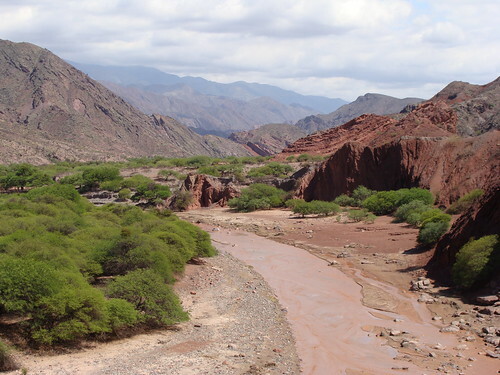 Up and down the river bed we heard the cows moo-ing, donkeys hey-hawed in their protesting way, the sound of passing horses added to the percussion section of this natural symphony. Dogs passed in silence searching for a bit of scraps to eat. The little town was a just a half a kilometer away and we could hear the children playing and laughing in the warm spring night. Randy and I wandered in the night listening to the magical sounds in the valley of the shells truly relishing this magical moment. Continuing our tour the following morning we rode past strange natural sandstone sculptures and stopped to visit signed points of interest such as the the Devil's Throat, Los Castillos (the Castles), El Obelisco (the Obelisk), El Fraile (the Monk), El Sapo (the Frog), and El Anfiteatro (the Amphitheatre). 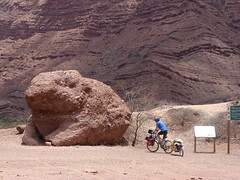 We reached Cafayate in the late afternoon and found a room at San Jorge, a family owned hostel. It is so easy finding hospitality in Argentina because all have the minimum I like to have. A good bed, hot water, clean and friendly. The only thing I did not anticipate was the hoarsely squawking roosters next door and the barking neurotic dog the next block over. Luckily we have ear plugs which allows us to sleep. Sweet ear plugs, sweet sleep. 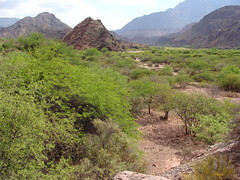 Cafayate is one of the premier wine growing regions in Argentina. Because of its high altitude and mild weather, it is the top producing area of the Torronte white wines. I can attest that after trying various kinds, that as long as you spend at least ten peso or over 3 dollars you will get a quality bottle of wine. We toured one vineyard personally, tried a few others but they where closed. We rode our bikes past dozens of highly productive vineyards with a background of poly-colored geological layers. Riding the route south was delightful but by the end of the day, we had come to an important junction on our trip. We just wanted to finish our adventure, after two years and 5 months, we have ridden 22,000 kilometers, and visited 13 countries. 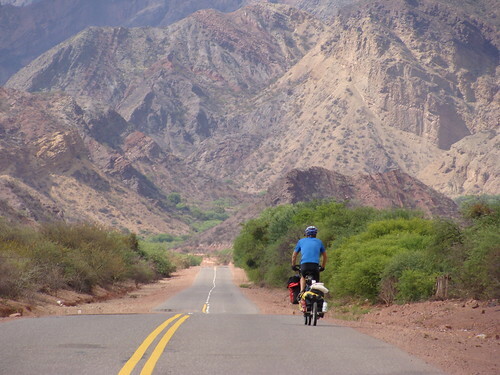 We had set out to learn about the wonderful varying cultures of the America, we had seen endless landscape of inspiring vistas and pedaled our bike threw hellish deserts, eaten traditional foods from all over the Americas, got sick on some. We have enjoyed the generosity of strangers who now are our amigos. We have been called Gringos by strangers and children excited to see us, in return we smiled and waved back at their excitement at seeing two touring bicyclists passing by. I have cried, we have laughed, we have danced and drunk from the well of life. I do not know how many photos we have taken but I might estimate it is over 10,000. Heck, I took over 500 at the Galapagos Island alone. We have spent as many hours in the Internet writing blogs, updating our website and writing to our old and new friends. I have created a ton of watercolors paintings. We even fulfilled our dream of doing volunteer work in Guatemala, Nicaragua and Peru. So after all this we have run short of time, money and desire to ride to the end of this continent. We want to go home. After resting a bit before we go back to the United States and back into a culture that is currently foreign to us. 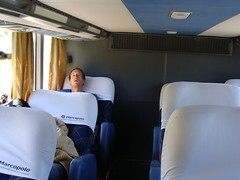 We loaded our bikes on to a bus for Tucumán and then bought tickets for a 36-hour, 2300 kilometer (1426 mile) bus ride to Bariloche, Argentina, a paradise in the middle of the Lakes district in Patagonia. We have rented an apartment for a month. The apartment is really a converted garage but a nice one with a very big backyard and trees and flowers. We will do some short trips from Bariloche, do some hiking, fishing, kayaking, horseback-riding, drawing and updating of our computer skills. Randy is doing some freelance website programing with Drupal and Nancy is drawing and searching for the right career. So many options it is hard to pin down the correct one. Vamos a ver (we will see). We have many things to still post on the websiteso return to the site for further stories and photos. PS. So if you are in the neighborhood, come on by. We would love to cook you up a home cooked meal. If you are cycling by we have plenty of floor space to camp on and would love to share our humble abode.